It’s hard to sum up how much I have valued the last few days in a short blog. 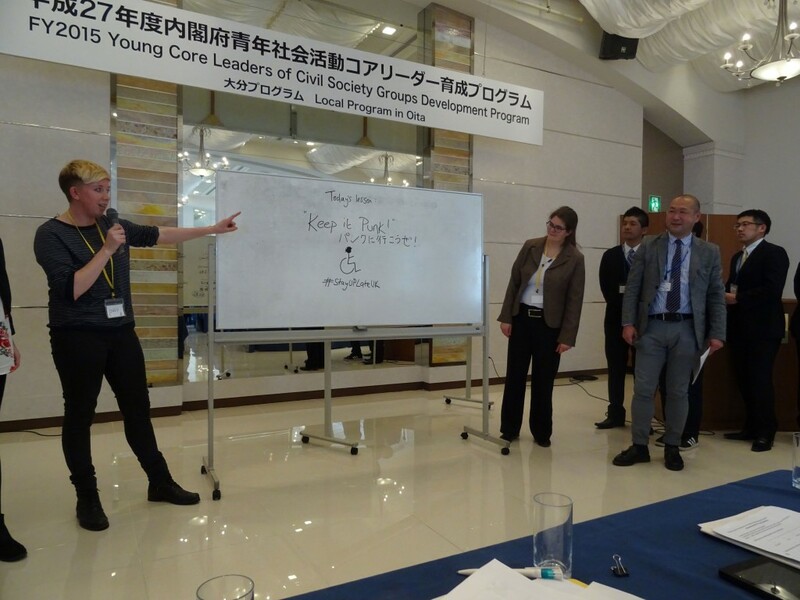 When I came to Japan I thought I was joining a team to give advice to help improve services here but in fact it has been much more about sharing good practise between all countries and what we can take home- learning what how to manage challenges we all face in Not For Profit organisations and how to create dream projects. 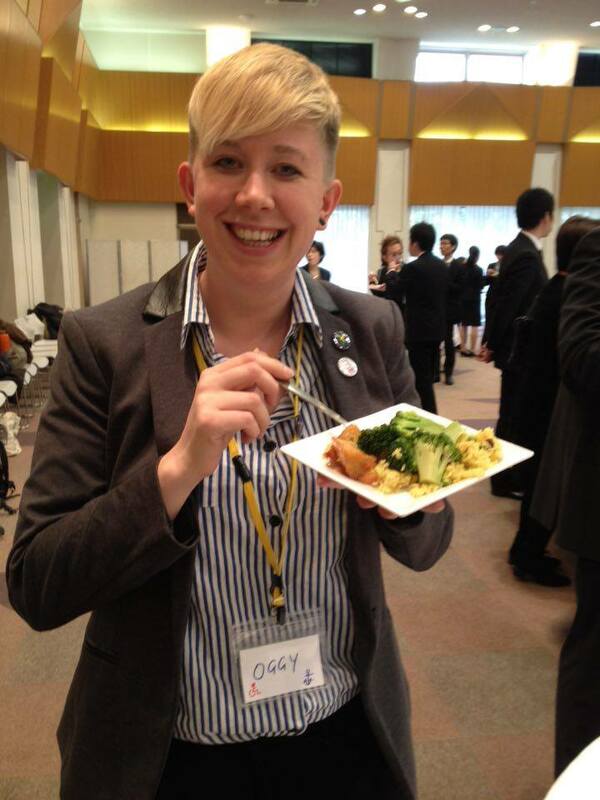 I have been in the far south of Japan all week in a place called Oita with the delegates from the disability course. 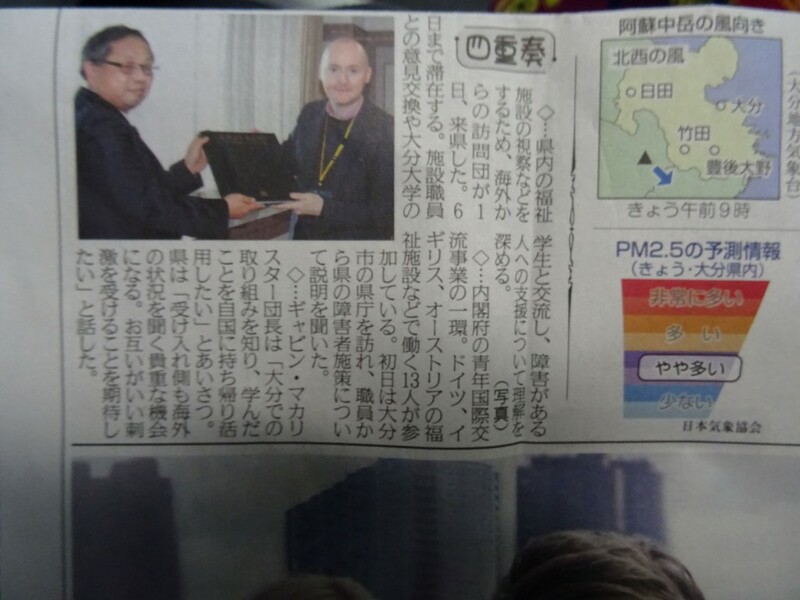 On arrival in Oita we were ferried straight to the local governments office where our group leader Gavin the Irish man did a thank you speech and handed over a very elaborate looking gift from us all – a book of images of Britain. He let me know afterwards it was £4 from his local WHSmith but looked much more impressive when you removed the colourful book sleeve and sale sticker! It was even more amusing when a photo of him handing over the book to a government official appeared in the paper the next day! This week has been more informal and practical with a mixture of visits to local institutions and discussions on how to improve organisational management, working conditions, and engage volunteers. I was anxious I would find the institutions I visited upsetting but in fact we have been shown some excellent services that have taught me a lot too. We have visited 5 facilities for people with disabilities up in the high lands of Oita famous for its natural hot springs. Surrounded by mountains and a view of the sea it has been a refreshing change from Tokyo. The first visit was to a centre for children much like my other workplace in Brighton Extratime. It’s called ECOAL (Enterprise Centre for Oita Autism Life) and supports 20 children with learning disabilities and autism to play – plus has family sessions with additional users. The centre was high quality, with great facilities, a huge soft playroom and plenty of toys, and the children looked & sounded happy. Unfortunately we were not able to go into the room where the children’s session was running because some of them have challenging behaviour and we are a big group so it could’ve understandably been unsettling for the children. We heard one banging on the door for quite some time but of course a group who work with children with disabilities were not phased and invited him in to join the lecture! We also did a workshop on how to keep supervisors of settings motivated which was really interesting as the centre has created a training course that has been rolled out nationally. The next visit was to a traditional Japanese restaurant next to the river that was run by people with learning disabilities. The staff with mild to moderate disabilities worked in the kitchen cooking the ramen noodles and serving the customers supported by other staff without disabilities. The staff with more severe disabilities work in the farm helping to grow the produce served in the restaurant and make beautiful craft items to sell in the shop. I bought many souvenirs here! It seems to be a very good example of a self-sustainable project and all of us agreed it was one of the highlights of the trip so far. We also visited a residential unit similar to those I’ve seen run by Southdown Housing in Sussex. We met some of the residents and they showed us around the communal areas and some of the bedrooms. It appeared to be a bit further behind than some of the better homes I’ve seen in the UK but much better quality than I had expected and the staff are passionate and committed to keep improving it. We have had many discussions and presentations about the history of volunteering across the countries and what motivates people to volunteer currently. In Germany you get 4 opportunities for work experience before 25 and many opportunities to get practical experience on your CV during studying which motivates people to get experience. In Austria volunteering has a long-standing tradition. There are opportunities to be Civil servants – particularly for men that don’t want to join the army they can work in the social field for a year instead but there motivation is very different as it’s about avoidance. In Germany, because joining the army was enforced, we heard that is has meant a couple of generations with low numbers of male workers in the social care field. We all agreed that many people who have a hidden motivation of volunteering get much more value of it than what they set out for and we should share these examples with others and celebrate this. 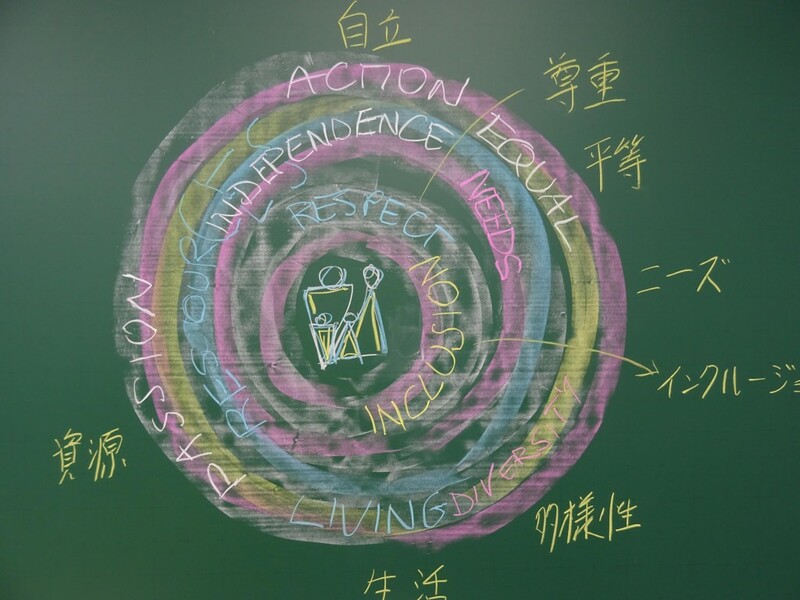 The turning point for volunteering work in Japan was the earthquake of 1995 in the west of Japan. Before this most volunteering was community work based with opportunities only being things like picking up rubbish. Oita Volunteer centre has 1,500 volunteers but 1,400 are specifically volunteering for disaster preparation, leaving only 100 volunteers doing more regular types of volunteering. These 100 volunteers are matched to organisations based on requests from social welfare institutions for where it is needed – such as if they want support for elderly by providing a befriender etc. 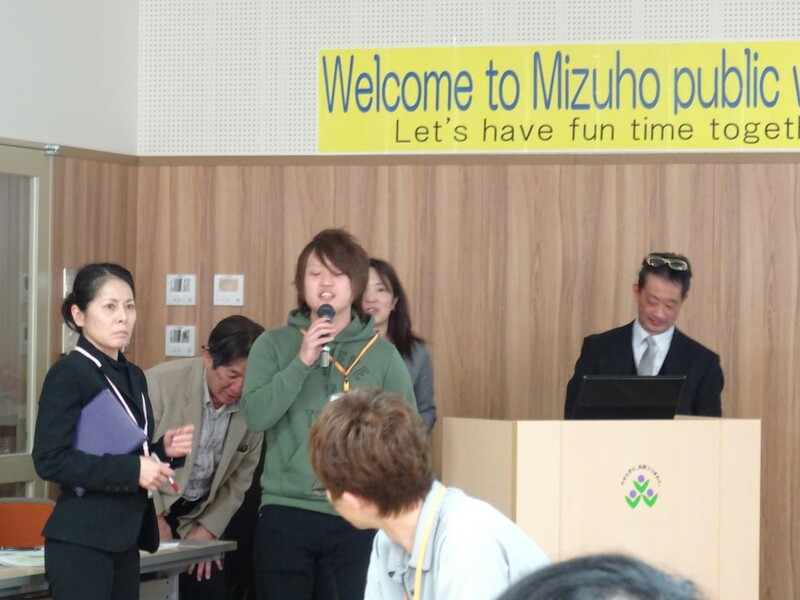 I was really impressed with the use of human resource (volunteers) resilience after national disasters in Japan. Many volunteers work together to try to rebuild other people’s lives. Training for volunteers includes how to run a centre for disaster zone. We were shown a very traumatic video of the tsunami hitting Japan in 2011 that killed 20,000 people. The volunteer centre supported thousands of people in temporary accommodation centres, but despite all their support, conditions were poor and people suffered from stress. 3,000 people still died in these temporary shelters. Watching this made me realise how despite knowing how much value a project like gig buddies is for helping social isolation for people with learning disabilities, when a country goes through such huge disasters like an earthquake and tsunami, on a potentially yearly basis, you can see why their priorities would be very different in terms of volunteering their time. Most volunteer centres spend their whole time preparing for another disaster. During the presentation we had a practice ‘disaster drill’ and all had to get under the table. We were then told the building was on fire and had to evacuate. Then we were told a 3 meter tsunami was coming and we had to run up to the 3rd floor (of the burning building) because it was ‘tsunami safe!’. As this was just a role play it was all very light hearted and at times quite amusing but this visit in general was the hardest part of the trip for me emotionally. To witness such devastation is very hard, but it was also so inspiring to hear about the resilience of the people to look after each other and the simple act of the human spirit. The manager of the volunteers centre said he hoped he had provided ‘a precious experience’ which he certainly had. After the trauma of the drill we were shown around the sports centre for people with disabilities where they had a heated swimming pool, and many people playing table tennis as they manage the national table tennis team from here – which was really exciting as we have a star table tennis player Harry in Gig Buddies! We also saw a wonderful parent support group for babies with Down Syndrome. Some of our discussion centred around the challenges of preparing people with learning disabilities for a disaster. As I experienced if you are an anxious person it can be very distressing even practising for such a disaster. So special needs schools are producing guidelines in how to support people with disabilities during traumas such as earthquakes and including it in volunteer training with getting them to wear an eye mask or headphones to simulate what it’s like for those with sensory impairments. They are also planning to train specialist staff in supporting people with disabilities during disasters as we heard the distressing fact that in the 2011 earthquake many families with children with autism did not feel they could access the shelters as their children wouldn’t cope with the change to routine and lack of facilities so they stayed in their cars which sounds completely unmanageable. There’s now 330 safe spaces in the country specifically planned for people with disabilities to get support from social welfare experts during a future disaster. During our evaluation of the week I spoke of how touched I was by the strength of the local people for coping during disaster but they also told me they were impressed by how gig buddies creates opportunities for volunteering to be fun. In the closing speech they quoted our slogan ‘keep it punk’ and promised it will be followed through after we leave. As we say goodbye to our hosts in Oita to head to our home stay for the weekend our Japanese friends give an emotional goodbye – the first time I have seen raw emotion from them and I am truly humbled to have been part of this unique insight into their culture and country.